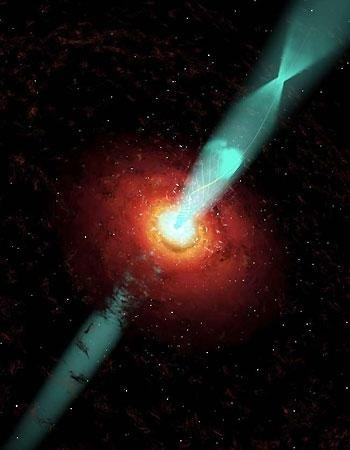 Astronomers Solve Mystery of Black Hole Jets? While we may never know what it looks like inside a black hole, astronomers recently obtained one of the closest views yet. The sighting allowed scientists to confirm theories about how these giant cosmic sinkholes spew out jets of particles traveling nearly the speed of light. Below is an artist’s rendition of one black hole in the BL Lacertae galaxy that spews out jets of charged particles accelerated by corkscrew-like magnetic fields. Anime Easter Bunny → ← Apple to Add Tactile Feedback to iPhone?